BPI Sports 1.M.R Vortex Review – Should you take it? BPI Sports is a company known for introducing supplements that work in a stack filled with their own products. Everything from post-workout, intra-workout, fat burners, and protein are all included in the BPI Sports stack. Before digging in to BPI Sports’ awesome row of products, you might want to check out the first product on that list – BPI Sports 1.M.R Vortex, BPI Sports’ pre-workout blend to improve your workout performance. In a nutshell, BPI Sports 1.M.R Vortex is like a pre-workout supplement cliché. It’s loaded with stimulants, blood flow boosters, and the added energy boost. At a dollar per serving, BPI Sports 1.M.R Vortex is at the average price range of most pre-workout supplements. The thing with BPI Sports 1.M.R Vortex is that it’s almost like every other pre-workout supplement in the market today, and we got ourselves asking – is there anything special about BPI Sports 1.M.R Vortex? We’ll find out. The main ingredient of BPI Sports 1.M.R Vortex is Glycerol. Essentially, it’s sugar plus alcohol. Glycerol has a hydrating effect which is helpful for endurance athletes. In a pre-workout mix, glycerol helps as an agent to enhance the stamina of the user. Glycerol helps to promote temperature regulation and it improves workout performance in the heat, but all it really does is help you retain water much longer so you won’t suffer from the effects of dehydration. Who uses BPI Sports 1.M.R Vortex? Since BPI Sports sells its product in stacks, it wouldn’t be surprising to find BPI Sports 1.M.R Vortex in the same bucket as other BPI Sports products. BPI Sports 1.M.R Vortex is more popular with endurance athletes than it is with recreational athletes due to the fact that its purpose is mainly to increase water retention. We measured the effectiveness of BPI Sports 1.M.R Vortex based on its content quality. The blend of stimulants and nootropics are expected in a pre-workout blend, and based on user reviews, it appears that its stimulant and nootropic content is on the mild side, which makes it easier for people who are sensitive to stimulants to take the product. You can expect a slight increase in focus and strength, and a little more improvement in endurance. Surprisingly, the best thing about the product is its flavor. User reviews about BPI Sports 1.M.R Vortex rave more about the flavor than the actual effects of the product. 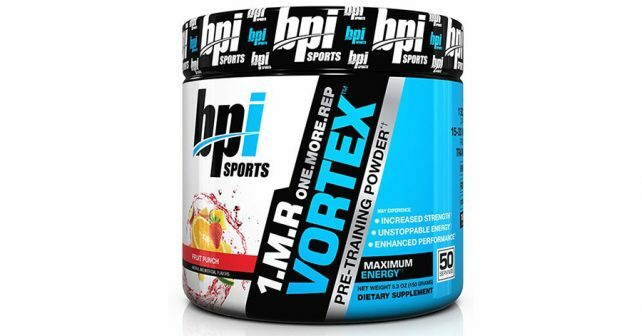 If you’re looking for a pre-workout drink that would please your palate, then BPI Sports 1.M.R Vortex is for you. Everything about BPI Sports 1.M.R Vortex is on the safe side. Others who are looking for stronger energy and focus boosters might want to look for something else. It’s best to stack BPI Sports 1.M.R Vortex with a supplement that enhances vascularity like NitroGenix 365 to amplify strength, endurance, and recovery.